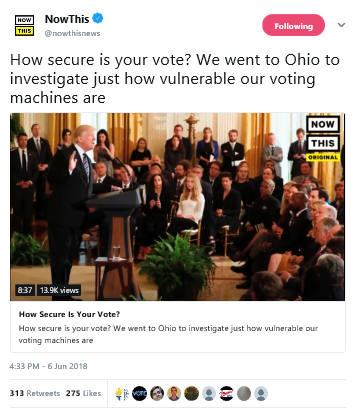 This handout strives to break through this disinformation with sourced facts that expose the truth about our computerized voting systems. But it goes further than that, providing a list of recommended protocols for 2018 and beyond, as well as suggestions and resources for effective advocacy. We hope that concerned citizens will use this handout as a tool to persuade decision-makers of the urgent need for hand marked paper ballots, robust post-election audits, and other security measures. All voting machines are at risk of internet hacking, even if they are not directly connected to it. “Over 9,000 jurisdictions (counties and states) in the U.S. run elections with a variety of voting machines: optical scanners for paper ballots, and direct-recording ‘touchscreen’ machines.” Contrary to what many election officials have told us, all such voting machines can be hacked through the internet, even if they are not directly connected to it. Before every election, all voting machines must accept programming to reflect the races on the ballot. They receive this programming via memory cards from computers that are themselves often connected to the internet. All precinct results are sent to central tabulators, often via vulnerable local networks. And central tabulators then transmit results to online Election Night Reporting Systems, providing easy access for internet hacking. ES&S and Dominion, which collectively account for 80% of US election equipment, both declined to attend the Senate House Rules Commitee’s July 2018 election-security hearing. 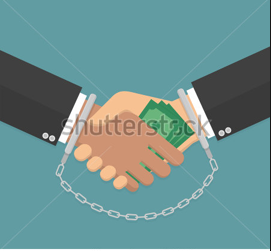 Corrupt insiders with direct access are also a major threat. Election systems are not decentralized. Election officials sometimes claim that voting systems are “decentralized” so that widespread, systemic meddling is not possible. However, just two voting machine vendors — Election Systems & Software (“ES&S”) and Dominion Voting — account for more than 80 percent of U.S. voting equipment. And the computers used to program the voting machines before each election are themselves centralized at the state or county level. In some states, a single third-party vendor may perform the programming for most or all voting machines in the state. While paper ballots can be used to verify the legitimacy of electronic tallies, fourteen states use paperless machines. The only way to verify whether an election has been hacked is to compare the electronic tally to the paper ballots. While electronic tallies from optical scanners can be verified (because optical scanners count paper ballots), tallies from paperless DREs are unverifiable. The following five states exclusively use such paperless machines: Georgia, New Jersey, Louisiana, South Carolina, and Delaware. Another nine states — including the swing states of Florida and Pennsylvania — include at least some counties with paperless machines. After the 2016 election, the state of Virginia made the decision to discard their DREs in favor of paper ballots. DREs with VVPATs — voting machine printouts that are supposed to reflect voter intent — are not in reality “voter verifiable,” as voters cannot confirm whether their vote as recorded inside the machine (where the counting occurs) matches the selections on the VVPAT. Hackers have repeatedly shown that the printed result can match the voter’s choices, while the internal memory records whatever choice the hacker wishes it to record. Thus, when vendors and election officials refer to these things as “voter verifiable,” they lull the public into a false sense of security. VVPATs matter, if at all, only in the unlikely event of a manual recount or audit. But VVPATs are useless even for that purpose unless voters actually review them for accuracy, which most do not. Studies show that voters are unlikely to notice computer vote flips even when they undertake such review, and that they are unwilling to start over even when told there is a problem.[Id.] It has also proven difficult or impossible to manually count or audit VVPATs. Moreover, like all touchscreens, DREs with VVPATs are vulnerable to denial-of-service-attacks, which could make the machines simply fail so that voters cannot vote at all. DREs were initially promoted as a means to accommodate voters with disabilities, but states bought them for all voters regardless of need, creating a 15 year election-integrity crisis. Disability groups have since called for their elimination. 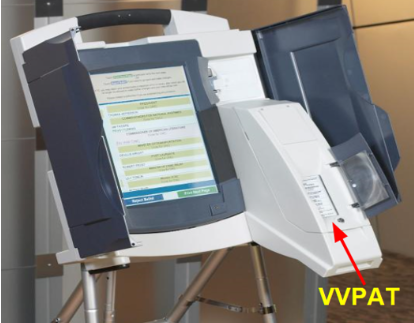 Some states are now replacing unverifiable touchscreen DREs with equally unverifiable touchscreen ballot markers. Electronic ballot markers (“EBMs”) are touchscreen devices that generate computer-marked paper printouts, which are then counted on optical scanners like hand-marked ballots. As with DREs, voters may never actually review the printouts for accuracy. The use of EBMs has traditionally been limited to those voters who are unable to hand mark ballots. But vendors are now encouraging states to buy them for all voters, regardless of need, adding an unnecessary extra layer of vulnerable electronics to our already vulnerable elections. 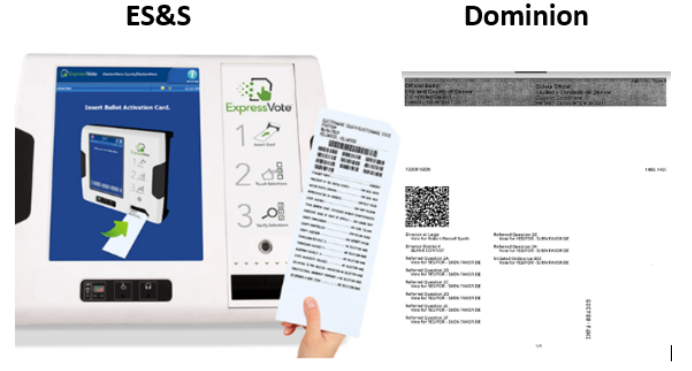 The ES&S ExpressVote and the Dominion ImageCast are the most popular EBMs on the market. 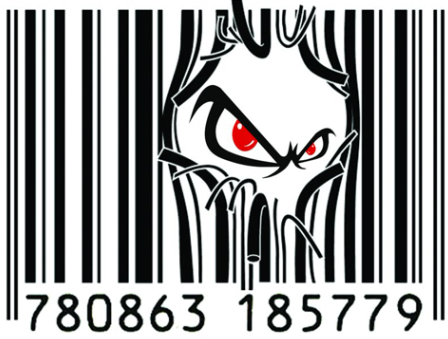 They are especially dangerous because the computer marked printous that they produce include not only written text, but also bar codes. The only portion of the printout actually counted as your vote is the barcode, which humans can’t read and thus can’t verify. Vendors and election officials, however, continue misleading the public by referring to these as “voter verifiable” or “voter marked.” Some further mislead by simply referring to these as “paper ballots,” without mentioning the barcode at all. Moreover, like all touchscreens, EBMs are vulnerable to denial-of-service-attacks, which could make the machines simply fail so that voters cannot vote at all. States rarely conduct manual recounts, even in close elections. Paper ballots make hand recounts possible, but states rarely allow hand recounts. Most require a hand recount, if at all, only when the margin of victory is less than a small percent. From a rigger’s standpoint, this simply serves as an invitation to shift enough votes to exceed the recount margin. As we saw in 2016, courts rarely allow a meaningful hand recount when that margin is exceeded. The cost for elective recounts, where allowed, is often prohibitive. Manual audit laws are absent and/or inadequate. States could address the manual recount problem by enacting laws requiring statistically meaningful manual audits after every election, with full hand recounts in the rare situations where audit results warrant them. But experts have determined that only a few states conduct audits that are anywhere close to sufficient to detect electronic tampering. Some election officials destroy ballot images. Most optical scanners used today produce digital images of the ballots as they count them. These images are public records, but some election officials destroy them. Vendors are not transparent. Most voters are unaware that taxpayer money goes to election equipment vendors with close past and/or present ties to such eyebrow-raising individuals and entities as: a foreign dictator thought to have rigged his own election, a sophisticated cyber-felon, U.S. politicians, and the far-right Council for National Policy. These vendors use the proprietary nature of their code and hardware to successfully block forensic examinations of their taxpayer-funded systems. Thus, no memory card in any U.S. election has ever been subject to inspection for hacking or malicious programming. Americans also deserve trustworthy elections. Thus, hand marked paper ballots must be available to all voters in time for the 2018 midterm elections, with assistive ballot marking devices provided for those who are unable to hand mark their ballots. A return to hand marked paper ballots means replacing DREs with optical scanners or hand counting. Jurisdictions may claim they can’t afford new scanners to count the paper ballots. But even most paperless states already use scanners to count paper absentee ballots, and they can use those same scanners to count hand marked paper ballots for all voters, even if it takes a bit longer. It is also noteworthy that, before the last election, some counties in Virginia leased scanners to ensure the integrity of Virginia’s last election. Other jurisdictions can do the same. States also have the option to publicly hand count the paper ballots instead. This is not asking too much. Spurred by serious concerns about transparency and security, most Western democracies — including Germany, France, Canada (for federal elections), Norway, and the Netherlands — have rejected voting machines in favor of publicly hand-counted elections. Although U.S. ballots tend to be more complex than in countries that hand count, most county election boards already have emergency hand-count protocols that can be implemented. Manual counting, if completed on Election Night, would not present the chain-of-custody problems that arise when we rely on next-day, or even-longer-delayed, manual audits to ensure the integrity of computerized election systems. Many counties in New Hampshire already conduct publicly hand-counted elections as a matter of course. According to the manual linked here, the ballots include on average 15 races and yet are fully hand counted within several hours on Election Night. Risk limiting audits (“RLAs”) or modified full hand-count audits. RLA’s or modified full hand-count audits must be mandated for every race in 2018. RLA’s are a type of statistical audit endorsed by Verified Voting, Common Cause, the League of Women Voters, the American Statistical Association, and others. Full hand-count audits are a kind of RLA where ballots are run through optical scanners and then hand counted under bi- or multi-partisan supervision. A modified full hand-count audit — the type of audit already conducted in Columbia County, New York — is the same as a full hand-count audit, but it excludes uncontested races and it hand counts fewer ballots in races with very large victory margins. All audits must be open to the media and the public. Elections must not be certified until the auditing process is complete and the audit results have either confirmed the accuracy of the initial vote count or led to a full manual count (the results of which will be dispositive). The chain of custody must be transparent and demonstrably secure. Post-election audits and recounts depend on a demonstrably secure chain of custody between Election Night and the audit (or recount), the period in which the public loses sight of the ballots. The chain of custody procedures must also be transparent or public confidence in the audit result will falter. During the 2004 presidential recount, ballots were “marked or altered, apparently to ensure that the hand recount would equal the machine count.” And in 2016, paper ballots were destroyed before they could be recounted in the Wasserman-Schultz/Canova U.S. House race. This can’t happen ever again in any election. Ballot images must be preserved. States must also follow federal law and protect election transparency by preserving ballot images as public records. Precinct results must be posted. Where precinct counting is done, precincts must post results to the public before transmitting them to the tabulators. This transparency measure would allow citizens to detect and deter any tampering or error that might occur after the results leave the precincts. Vendor transparency. To provide a measure of transparency, election equipment and software vendors and contractors must publicly (a) disclose the names of each of their officers, directors, and owners; (b) disclose the names of each of their parent companies, as well as the parent companies’ respective officers, directors, and owners; and (c) warrant that no one affiliated with the company or with a parent company (as officer, director, owner, employee, contractor, or consultant) has been convicted of a felony. 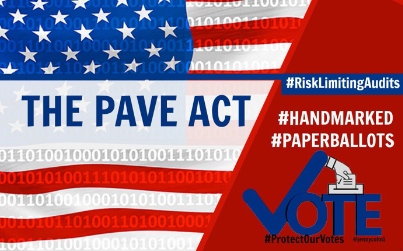 Tell members of Congress to pass the Pave Act. The Secure Elections Act — a bipartisan measure also pending in Congress — is missing both of these critical elements. We cannot afford to have a bill that lets election officials continue pretending they have secured our elections. We need a bill that actually secures them. 2. 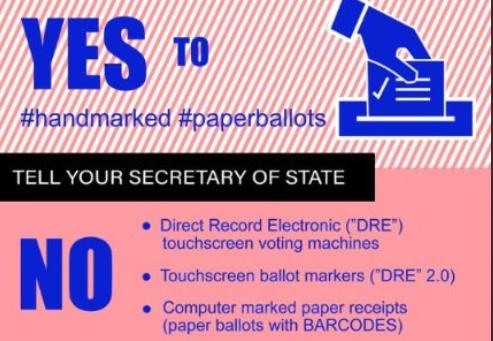 Tell state and county election boards to use hand marked paper ballots in the midterms, not touchscreen voting machines or touchscreen barcode ballot markers. In addition to supporting the Act, please demand action from your state legislators and state and county Election Boards. If states can’t or won’t buy or lease optical scanners in time for the 2018 midterms, then they should use their existing scanners (which they already have for paper absentee ballots) or conduct precinct-based hand counts, looking to New Hampshire for guidance. Secure Our Vote has organized a grass roots campaign to lobby state and local election boards for paper ballots and Risk Limiting Audits. Their website also has excellent written training materials. Verified Voting has a terrific website. Its “Verifier” tool shows the type of voting equipment used in each state. Verified Voting also has a state audit law database. Citizens for Election Integrity Minnesota has an excellent website where you can search for each state’s recount and audit laws. Center for American Progress posted an extremely helpful report grading each state on its voting and registration system security as of February 12, 2018. It too, however, glosses over the critical distinction between hand marked paper ballots (democracy’s gold standard) and computer printed summary cards from touchscreen barcode ballot markers like the ExpressVote (which will be a disaster for election security). Background: Jennifer Cohn is an attorney and election integrity advocate in the San Francisco Bay Area who graduated from UCLA and Hastings College of the Law. As an attorney, her areas of practice included insurance coverage and appellate law. She practiced law for more than twenty years, including seven years as a partner with Nielsen Haley & Abbott, LLP in Marin County, California. Since 2016, she has devoted her professional efforts full time toward investigating our insecure election system and potential solutions. She can be contacted through her Twitter account, @jennycohn1. Acknowledgements: Thank you to election integrity advocates Jonathan Simon (author of Code Red, Computerized Election Theft and The New American Century and blogger at CodeRed2014.com/blog), Brad Friedman (host of the BradCast with Brad Friedman radio show and a blogger at bradblog.com), Lulu Friesdat (Emmy Award winning journalist and documentarian), and Philip B. Stark (Professor of Statistics at U.C. Berkeley) for their substantial time and effort helping produce this handout. https://www.stat.berkeley.edu/~stark/Seminars/penn11.pdf, p. 3 [Risk Limiting Audits are endorsed by Common Cause, the American Statistical Association, the League of Women Voters, and others]. For more information about full hand count audits, please contact Virginia Martin, Commissioner on the Columbia County, New York, Board of Elections. https://countedascast.files.wordpress.com/2017/10/2-tier-approach-to-audits-oct-2017-friesdat.pdf [article by election integrity advocate Lulu Friesdat describing full hand count audits conducted in Columbia County, New York; includes comments by Virginia Martin, commissioner on the Columbia County Board of Elections]. For more information about ballot images, please contact John Brakey of Audit AZ and Bev Harris, author of Black Box Voting: Ballot Tampering in the 21st Century.